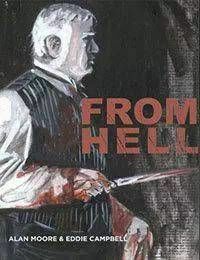 From Hell features the story of Jack the Ripper, the most infamous serial murderer of all time. Alan Moore names Dr. Gull as the villain and creates the most compelling and terrifying psychological study ever undertaken. All the conspiracies and cover-ups are considered and bound together in this vortex of terror. A gripping crime noir masterpiece of historical fiction.